Cliff Lee pitched a complete game (9-6-1-0-10, 122), not allowing a Yankee beyond second base until an unearned run scored in the ninth. 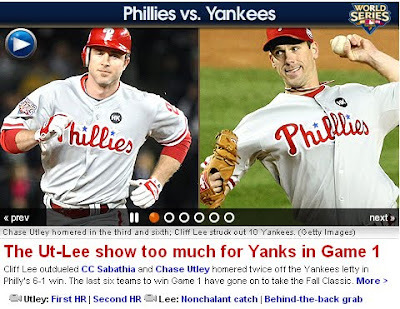 Chase Utley hit two solo home runs off Sabathia (7-4-2-3-6, 113) and Raul Ibanez hit a two-run single in the eighth. Shane Victorino and Ryan Howard had RBIs in the ninth. Derek Jeter had three of New York's six hits and scored the lone run in the ninth. Alex Rodriguez went 0-for-4 with three strikeouts. Mark Teixeira was also 0-for-4 and, like Slappy, failed to hit the ball out of the infield. 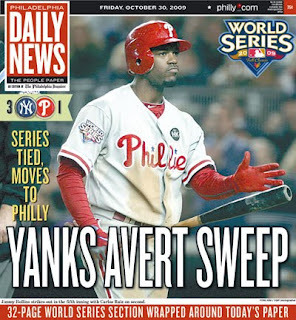 It's the third straight World Series in which the Yankees lost Game 1 (2001 and 2003). Eleven of the last 12 teams to win Game 1 have gone on to win the World Series. The Infinite Winter discussion board is here. Anyone out there -- regular commenter or lurker -- who wants to participate, sign up and drop me an email. Let me know what you think about the tentative reading schedule. 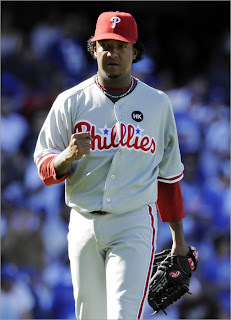 Pedro Martinez will get the ball for the Phillies on Thursday night in Yankee Stadium for Game 2 of the World Series. Pedro last faced the Yankees on June 27, 2008 at Shea Stadium (5.2-6-6-5-4, 106). He last pitched against the Yankees in their home park on June 24, 2005 (8-6-2-2-3, 106). Charlie Manuel said that Cole Hamels will start Game 3 in Philadelphia. I think it would be very tough to take four. You figure one game they are going to find a way to win. That's the way it is. ... If we're nice, we'll let it go six, but I'm thinking five, close it out at home. Brad Mills has been hired to manage the Houston Astros. Mills had been the bench coach since Terry Francona was hired before the 2004 season. Before that, Mills had managed in the minors for 11 years: Cubs (1987-92), Rockies (1993-96) and Dodgers (2002). Terry Francona hopes that Mills's replacement comes from within the organization. I think that's something that's important. I've been here long enough now that it's something that definitely needs to be considered. Francona and Mills were college roommates, they played together for the Expos, and Mills was a member of Tito's coaching staff in Philadelphia. "I think you make your own destination." Videos from Brian Fox and Ben Cohen. ... The Final Out. ... And one my favourites: "ALCS 7/Cool Kids". Today is the deadline for submission of MVP ballots at the Baseball Bloggers Alliance. I had hoped to spend more time on this, but that didn't happen. So all I have is a list, with a few notes. After #1, you could shuffle the remaining spots any which way you want. I liked finding out that Zobrist and Teixeira had the exact same OPS (.948). If I looked at this for another five minutes, I might move Greinke and Cabrera down, Lind or Kubel up, and maybe bump Morales. There are good arguments that everyone "should" be higher than they are. 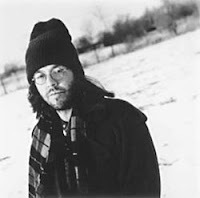 Back in June, I mentioned re-reading David Foster Wallace's 1996 novel Infinite Jest during the off-season. At that time, three commenters mentioned the possibility of reading it also. Game 7 of the World Series is scheduled for November 5. We could start on Monday, November 8 -- which, re the chronology of the novel, would be a great day to start. If we follow the same 75 pages per week schedule as Infinite Summer, we'd finish a week or two after the arrival of pitchers and catchers. It seems like a pretty quick pace. Maybe it'll be fun. Or maybe it'll fizzle out before Xmas. Anyone interested*? * When it was released three years ago, the 10th anniversary paperback was only $10. Cheap! Alas. 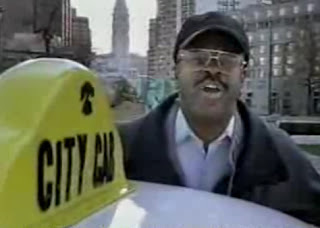 Go Pedro & the Phillies. Officials made the call to postpone Game 6 although they were leery of making the move because the Angels potentially could benefit. Maybe this ties in with the MLB.com goof in the previous post. 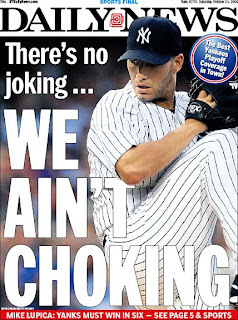 [I]f Pettitte does the kind of job he has done for a very long time in New York, going all the way back to October of 1996, then the Yankees don't have to worry about another one-game season against the Angels. 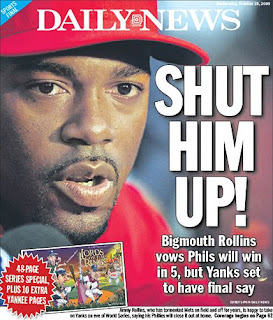 Then again, here's another Game 6 pitched by Big Game Andy, during another series in which the MFY led 3-2. They need to win one of the next two games on their home turf, a place where they lost two straight games only twice since A-Rod returned on May 8. Or maybe the fix is in. Tim Wakefield had back surgery (herniated disc) on Wednesday. Everything was awesome. The whole procedure went as planned and even post-op, meeting with the surgeon, Dr. [Lawrence] Borges, everything went perfect. He didn't see any further damage in there. He made sure everything was cleaned up and ready to go. It went perfect and I should be ready to go by Spring Training. I do have some goals in mind. I obviously want to get to 200 wins [he has 189] and I want to try to become the all-time leader in wins in Red Sox history. I'm 18 away from that. Past that, I really can't tell you. Wakefield already holds the franchise record for losses (150). Young (112) and Fat Billy (111) are 2nd and 3rd. Wake also hold the Red Sox record for the most games started, batters faced, HBPs, wild pitches, earned runs, hits, walks, and home runs. And he could sit atop the innings pitched category next season. At 2,711.1, he's 17 behind Young (2,728.1) and 64.2 behind the TCM (2,776). Game 6 is postponed ... will be made up tomorrow [8:20] and Game 7 will be moved to Monday, if necessary [7:57] ... rained out because "Forecast was holding true and it predicted rain throughout the evening" MLB official ... Another exec said there wasn't a chance of clearing before 10 p.m.
Come in from the ledge. Take some deep, cleansing breaths. Relax. Everything is going to be fine. Stop flashing back to the American League Championship Series of 2004. The Yankees could have won Game 3 and gone on to sweep. Could have closed out the Angels Thursday night. ... It is the Yankees who are playing for their season tonight. But if the Yankees lose tonight, they will need to play a do-or-die Game 7 tomorrow night at Yankee Stadium, meaning there would remain a chance for their season to end without a World Series appearance -- just like in 2004. Don't look at comments before you do, though. Note: When you type in a correct last name, it will automatically be inserted into the roster; you don't have to hit enter or anything. the worst postseason collapse in their history. Yes, this would be worse than coughing up a 3-0 lead to the Red Sox in 2004. [T]hese Angels are not nearly as good as the 2004 Red Sox. 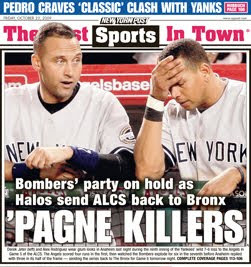 And these Yankees are a lot better than the 2004 Yankees. At least, they're supposed to be. 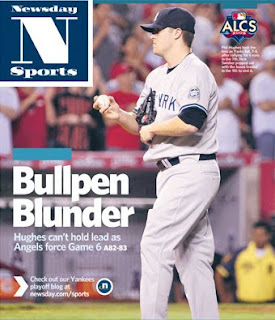 If the Angels come back, the Yankees would have spit up a 3-1 lead, not an unprecedented 3-0 advantage. That alone makes Matthews dead wrong. But there is also this: the Angels are the Angels and the Red Sox were the Red Sox. Then again, this is the same writer who complained that Tim Wakefield was perhaps the slowest worker on the mound in baseball and called him and his knuckleball "a bigger menace to the game than steroids". ALCS 6 is Saturday at 8 PM. Lisa Swan at Subway Squawkers asked ten Red Sox bloggers a few questions about the post-season and our thoughts on a possible Yankees championship. Here. An accusation that Mariano Rivera spat on the baseball yesterday began at HalosHeaven* and a short video clip has been making the rounds. This silliness got enough attention that MLB actually released a statement, saying it saw no evidence of misconduct. I don't think anything worth mentioning is going on here. The camera angle is inconclusive; you don't prepare to throw a spitball by actually spitting on the ball; and pitchf/x data showed the pitch after the supposed spitting had modest movement. this is pretty conclusive evidence of why Yankees pitcher Mariano Rivera is able to throw only one pitch that has unpredictable, yet precise movement. If that were the case, Rivera would have been caught for something so clumsy back in 1995. The Angels could tie the series at 2-2 tonight. The team's fans should be concentrating on that (and inflating their Thunderstixx and picking lint off their stuffed animals), not stockpiling inane "reasons" to whine their heads off if LA loses the pennant. *: Reading this post and the ensuing comments will likely lower your IQ by at least 15 points. You have been warned. In his nine no-decisions, Greinke had a 2.35 ERA -- still good enough to top the American League. And it was a better ERA than every starting pitcher in MLB except for Chris Carpenter (2.24). Greinke's ERA in his losses was still better than the AL average (4.75). The Royals scored an average of 3.78 runs in Greinke's starts. He had three runs of support or fewer in 19 of his 33 starts. According to ESPN's Dave Campbell, if CC Sabathia had received the same run support as Greinke, he would have finished the year with a 10-11 record. Greinke's W-L with CC's backing? 24-3. It's not hyperbole to suggest that, with an even average defense behind him, Greinke's ERA could be in the 1's right now. John Dewan's Total Runs metric has Grienke as the American League MVP. Drive Line Mechanics seems to agree. Kevin Millar drew his infamous five-pitch walk just before midnight. "Ortiz fights it off, center field! Damon running to the plate ... and he can keep on running to New York. Game 6 tomorrow night." "He didn't do it again, did he? Yes, he did!" Deadspin has a two-part article from Eric Walker, the man who brought progressive baseball analysis to Billy Beane and the Oakland A's. In baseball, some numbers are known, some are not, and the meaning of most of them can be debated. But there's one number everyone knows and agrees with: three. Three outs and you're gone. Period. The end. All runners cancelled, all theories moot, all probabilities zero. That number must, in any rational evaluation of the game, dominate planning. Despite all the seasons that have flowed by since [Branch] Rickey and [Earnshaw] Cook and [Bill] James, there remains to this hour a great divide, a sort of cultural barrier, between "old-time baseball men" and the so-called "new breed" of analysis users. That pains me, because though the details of analysis can be abstruse and mathematical, the basic concepts, with only a modicum of patience, can be explained even to hostile disbelievers, who disbelieve for the very reason that no one has ever troubled to make those clear explanations to them — at least not in language they speak. 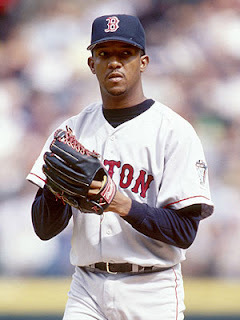 Pedro Martinez makes his first post-season start this afternoon since throwing seven shutout innings in Game 3 of the 2004 World Series for the Red Sox. Pedro gets the ball for the Phillies in NLCS 2 (4 PM) at Dodgers Stadium. However, Martinez has had only seven innings of work since September 13 (starts on September 19 and 30) and a simulated game on Tuesday did not go well. 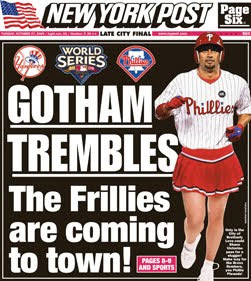 Philadelphia won NLCS 1 8-6 last night. 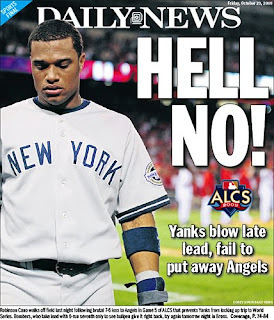 The Angels and Yankees begin the ALCS tonight -- Lackey/Sabathia -- at 8 PM in New York. The Red Sox will meet with 18-year-old Japanese pitcher Yusei Kikuchi next Monday. Kikucki will also talk with representatives from the Dodgers, Rangers, Giants, Yankees, Mets and Mariners next week. Takashi Saito has been outrighted by the Red Sox off of their 40-man roster. This is likely a prelude to the team not picking up the 2010 option on his contract. Speier says the team holds a $6 million option (the amount of salary + incentives earned from 2009 is the club option total for 2010). America used to be a simple place, didn't it? The pilgrims set the tone by using religion as a unifier, not a bludgeon. Our neighbors, such as the Native Americans, were respected as natural inhabitants and were treated as such. Our country could do no wrong and you can hear that perfection in McCarver's voice. [I]n the process of listening to an entire great American songbook, your brain will take you away to anywhere between three and seven pictures, idylls and reveries that tap into the collective unconscious memory of what it meant to walk amidst eden. Each song is delivered with what I can only describe as a kind of calm-eyed beauty that seems to recursively calm the process of singing the song itself. 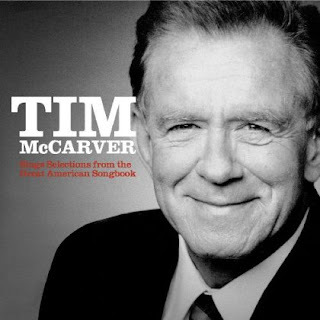 I would rather listen to this Tim McCarver album than Bob Dylan's latest offering. Theo Epstein mentions team defense and defensive efficiency and the lack of offense outside of Fenway Park as big issues going into the winter. The foundation of the organization is still strong, we have a pretty good core of prime players, there are probably 10 guys in their mid-20s or right around 30 who we can build around and a strong farm system, with tremendous payroll flexibility going forward. I think it could go a number of different directions. I think we're always open to change because I think you need change to improve as part of the natural cycle in baseball and in life. Sometimes the market doesn't bear that out. Sometimes there aren't the right fits, sometimes it's not the right free-agent market and sometimes you end up with more status quo than you want. If that's the case, if we look back three or four months from now and say, "Wow, there weren't major changes," then I think next year will be perhaps the last year of this main group of players. We have a lot of players going into contract years next year. I think it might be one more chance with this group to go out and win the whole thing. Will Jason Vartiek return as the back-up catcher? What about Mike Lowell, who is due $12 million? 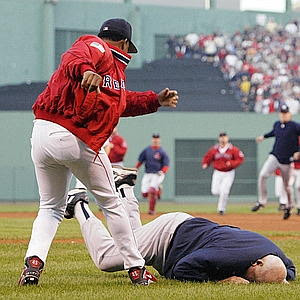 If Lowell is not in Boston and Kevin Youkilis moves back to third, who plays first? Who will be the regular shortstop? 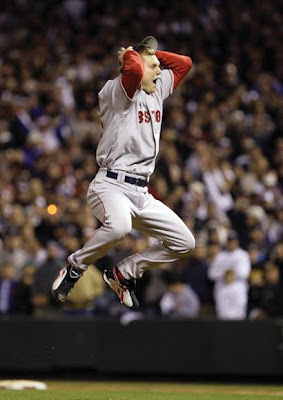 What will happen with Jason Bay? How much offense will David Ortiz provide? Will the Sox bring back Tim Wakefield after his back surgery? What kind of turnover will there be in the bullpen? Will Epstein revisit any of the potential deals that were mentioned before the July trade deadline? Epstein characterizes the negotiations with potential free agent Jason Bay as "really unusual ... [W]e want to keep him and he wants to be here and yet we've been unable to reach a deal. I don't think either side's been unreasonable. ... It just hasn't happened." If Bay declines to return, Matt Holliday is a possible free agent acquisition. Sean McAdam mentions Bobby Abreu, Chone Figgins and Johnny Damon as possible left field replacements. McAdam also drew attention to Epstein's comment on Monday: "If Ortiz is going to be our DH ..."
Quotes in the Post suggest Billy Wagner is considering retirement. His agent thinks otherwise. There are strong expectations that he shows up in February in fantastic shape on Day 1 of spring training next year. I see it as a necessity, not really an option. Michael Silverman looks at some of the Sox's brighter prospects, including pitcher-shortstop Casey Kelly and outfielder Ryan Westmoreland. About as tough a loss as you can have. This one hurts down deep. You can't even classify how this one hurts more than any other. We've finished people up in three games before, too. It tells you as quick as it comes, as quick it can go. I don't think anything that occurred in this series came completely out of the blue ... There were certain things that went down this series that were foreshadowed in the regular season as well. The season doesn't wind down. It just comes to a crashing halt. You go into the top of the inning excited because you think you're going to keep playing. Half an inning later, you're going home. The game begins in the spring, when everything else begins again, and it blossoms in the summer, filling the afternoons and evenings, and then as soon as the chill rains come, it stops and leaves you to face the fall alone. You count on it, rely on it to buffer the passage of time, to keep the memory of sunshine and high skies alive, and then just when the days are all twilight, when you need it most, it stops. Today, October  ... it stopped, and summer was gone. Jonathan Papelbon allowed two inherited runners to score in the eighth and then, needing only one more strike for the save, allowed three runs of his own. And the Angels move on to the ALCS. Two quick thoughts: Walking Hunter intentionally was dumb. Should Tito have pulled Bot after Abreu's double made it 6-5? Bot had allowed three straight hits and four hits to his six batters. When did Jeemer get up and was anyone else up with him? Note: I'm not blaming Francona (not much, anyway). Papelbon tried to get the third out against five hitters and failed. What's happened has happened. Now we'll show up tomorrow, do what we always do on early games -- have 12 pieces of bacon, a Red Bull and go get 'em. Interesting: An AL team has never gone L-L-W-W-L in an ALDS. One possible reason for Clay Buchholz's poor performance in his last two starts (13 runs in eight innings against Toronto and Cleveland) is that his body is tired from throwing more innings this season than in any other. Francona will stick with the same nine hitters in his lineup, though David Ortiz may get moved down with a lefty on the hill. Hendu was "David Ortiz" when David Ortiz was 10 years old. JoS is part of the Baseball Bloggers Alliance and the site is gathering votes for MVP, Cy Young, Rookie of the Year, and Manager of the Year. There are three Red Sox blogs in the BBA; Derek (Inside The Monster) and Christine (Boston Red Thoughts) run the other two. 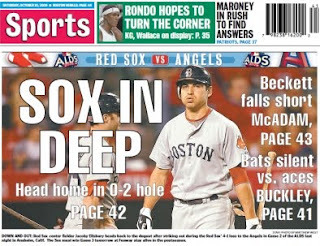 How bad is the Red Sox's sudden slump against the Angels? In Boston's last three playoff games (including 2008 ALCS 7), the Red Sox have scored two runs on 11 hits in 27 innings. I don't know about surprising [being down 0-2]. I don't think we've played well enough to win either game. ... We definitely dug a pretty good hole for ourselves. We're not eliminated until they win the third game. There really is no big picture for us right now. We just have to go out and win a ballgame or we're going home. Terry Francona is leaning towards using Jon Lester on three days rest in Game 4. Josh Beckett would pitch Game 5 on normal rest. 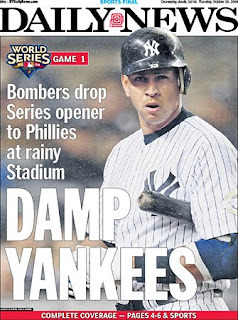 ... Jacoby Ellsbury's fourth inning triple broke an 0-for-24 post-season drought. The Red Sox got on a plane ASAP last night, but the Angels will workout at their park today before heading east. Mike Scioscia: "We're going to work out here before our flight and then we'll get into Boston and get a good night's sleep and get ready to play." P.S. : According to SoSHer Eric Van, home plate umpire CB Bucknor "made two calls in this game that were even more damaging than the two calls the previous night ... and they helped the Sox. ... You have to wonder whether he was consciously or unconsciously trying to avoid the appearance of bias." See here. Another four hits, another resounding loss. 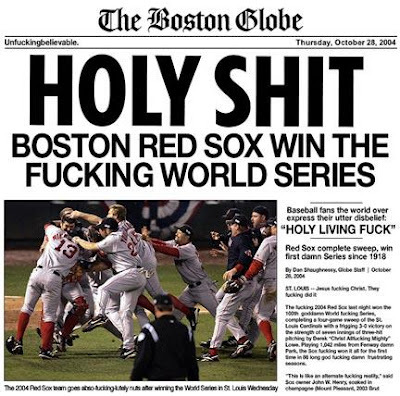 And the Red Sox will fly back to Boston in an 0-2 hole. Game 3 is on Sunday at noon. Only four American League teams have come back from being down 0-2 in an LDS -- and two of those four are Red Sox teams (1999, 2003). So it's certainly possible, but this team will have to rouse itself from its offensive slumber to do so. Beckett and Weaver had a hell of a pitchers duel going until the 7th-inning stretch. Only one player reached base in the first three innings. Both teams scored in the fourth: Jacoby Ellsbury tripled and scored on Victor Martinez's single; then Bobby Abreu singled, took third on Vladimir Guerrero's hit and scored on Kendry Morales's sacrifice fly. Beckett began the seventh at only 75 pitches and having retired the previous eight batters. He fell behind the first two hitters 3-0, walking Guerrero (his only pass of the game), but battling back to retire Morales. With Juan Rivera at the plate, pinch-runner Howie Kendrick stole second. Kendrick stayed put as Rivera grounded hard to third, but he was able to score on Maicer Izturis's single into right-center, giving LA a 2-1 lead. Billy Wagner had been up for awhile, but Terry Francona stayed with Beckett. Izturis stole second on the first pitch to Mike Napoli. Then Beckett plunked Napoli with a 2-2 curveball. It was time for a pitching change, but Playoff Tito was nowhere to be seen. Erick Aybar whacked a 2-1 pitch over Ellsbury's head in center for a two-run triple, bringing the curtain down on Beckett's performance. Is tonight a must-win? It feels like it. There are no issues physically at all. Obviously last year was a little bit different. So as far as physically coming in (this year), it's a lot better. Last month it's been better than it was two months ago, so I'm just looking forward to going out there and doing what I'm supposed to do. We had four singles and three errors. That isn't going to win too many ballgames. We need more offense. The Red Sox were held without a run and without an extra-base hit only five times during the regular season. Terry Francona "fell ill an hour before first pitch with food poisoning". Bad tacos for lunch, apparently. He missed the introductions and Brad Mills was told he might have to take charge, but Tito was there when the first pitch was thrown. Asked after the game about the umpiring ("What was your main complaint or beef there? "), Tito said: "Don't bring up the word beef, please." Francona's regular cribbage opponent is now George Kottaras. "Pedey quit 'cause he stinks." ... David Ortiz and Dustin Pedroia each were tested for performance-enhancing drugs after last night's game. No word if CB Bucknor was given an eye exam. The New York Times says Chip Caray "is still prone to bad play calls, descriptive exaggerations and factual errors. ... [There is] a pattern of an announcer out of his element." Times: Game 3 is set for Noon on Sunday. Game 4 will be at 8:30 on Monday, but would be moved to 7:30 if the Twins-Yankees series is finished. Game 5 in Anaheim is set for 9:30, but will be moved to 8:00 if there are no other games scheduled. 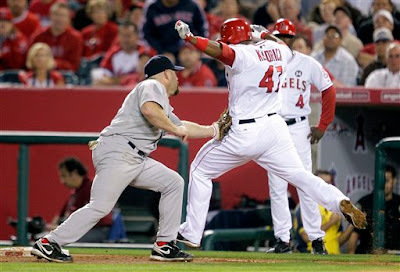 Here is Kevin Youkilis tagging out Howie Kendrick in the fourth inning. First base umpire CB Bucknor called Kendrick safe. Babe Ruth has struck out looking. Displeased, he leans on his bat, right hand on his hip, and looks back at the umpire. He utters something that can only be imagined. Lou Gehrig, on deck, leans on his bat, too, as if he has seen this act before. Ruth finally shuffles away, head turned to the umpire, dragging his bat through the dirt. The latest Babe Ruth film, unseen publicly until now, is part of a 90-second clip shot from the first-base stands at Yankee Stadium. There is no sound. But there are sweeping views of the park. And there is Ruth ... [I]t represents the archive's only game action of Ruth playing in the outfield -- where he spent more than 2,200 games -- other than a between-innings game of catch. Is Matsuzaka Tipping His Pitches?